Whether your company has a dedicated meeting planner (or event management is just one of your many responsibilities), you can enhance your events by creatively integrating promotional merchandise into your planning. Invite participants with flair. There’s no reason an invitation has to be the traditional yawn of engraved stationary. Go bold! For example, if you’re hosting a beach-related event, present your invite in a vinyl-pouch envelope filled with sand. Or, for an incentive trip to Hawaii, deliver a lei with a card-stock invitation tied to the silk-flower necklace. Both examples show how an invitation can be three-dimensional, as well as theme-appropriate. Keep programs on schedule. Send a stop watch in advance of your next important meeting to each invited participant. Ask that they prepare their presentation to fit within a specific time limit. Keep the request light-hearted and you will have employed a fun, useful way to underscore the importance of staying on schedule. Consider practical needs. Almost every conference or event involves products that can be imprinted with your brand or message – napkins, cups, pencils, folders, etc. 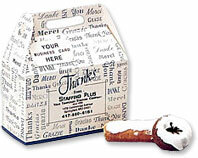 Even the donut box delivered for morning meetings can be customized with your organizational message. Make travel easier. Provide attendees with products that speak to their travel needs. For example, deliver travel itineraries in a clear vinyl pouch with lanyard, allowing the wearer to conveniently carry travel documents and identification which helps simplify clearing security checkpoints at airports. Similarly, small vinyl bags with appropriately-sized travel containers for shampoos, etc., allow for carry-on efficiency while meeting airline safety standards. Or, give a travel blanket and inflatable pillow with a note to arrive “well rested” for the event ahead. Ensure a memorable experience. Thoughtful gestures are always an effective way to close a meeting or conference. One popular idea is to have photos taken of event participants with a special speaker (or simply at some point in the course of the conference). Present the remembrance in an engraved frame; it will serve as an enduring desktop reminder of what was learned or achieved during the event. For more ideas on how to put some promotional panache into your next meeting or event, please call us at 708-478-8222, send us an e-mail or visit us online at www.linjen.com.